Arnel phoned to inform us (Juvy and I) that he needed to pick up first his “lady friend” before going to our hotel to fetch us. 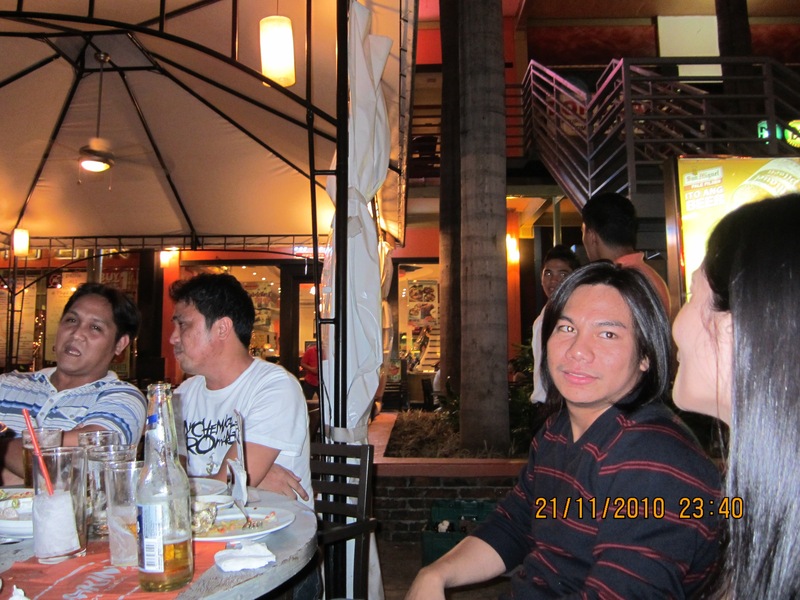 He further mentioned that his college friends will be joining us in our night out (a.k.a. gimik). 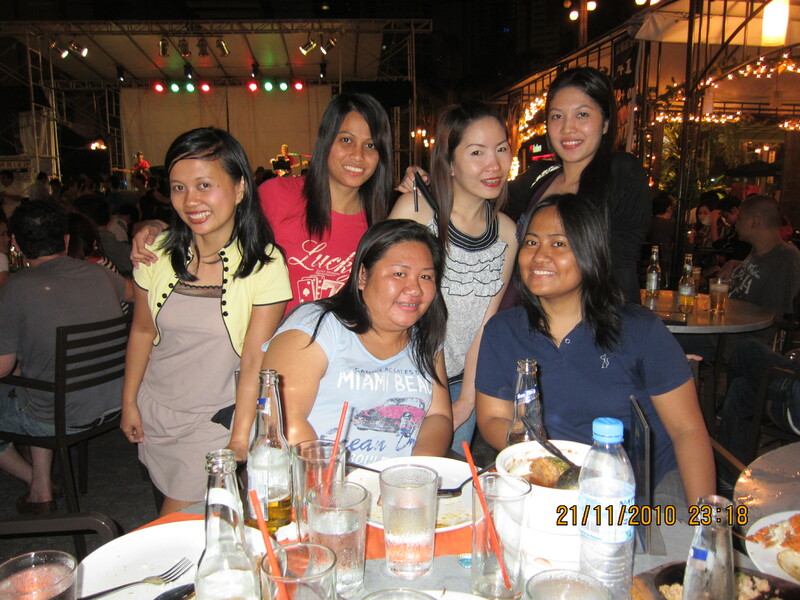 Arnel, Reyn, Juvy (the “Singaporean”), NoliPogi, Deo, Cynthia, Rosvie, Elma and I met up in Metrowalk. It was Reyn and Juvy who were the lovely guests in our gimik because majority of us graduated from Lorma Colleges so in a way, we all know each other either by name or by face. Elma was late and was mumbling unintelligible excuse when she arrived. By that time, the early birds were already enjoying a “kilometric” babble and exchange of demure smiles. Little did we know that Elma will become the “star” of the night. Elma: (Looking at Juvy) How do you find the Philippines? Elma: (Speaking in Ilocano, a language used in Northern Luzon (Ilocos Region), Philippines) Apay haan na ammo ag English? Cynthia: (Speaking with certainty) Juvy can speak English, she’s a bit shy. She’s the daughter of TheCuriousme’s boss. Elma: (Turning to Juvy) I went to Singapore last year. It’s a very beautiful country. I saw the Merlion. You know the half fish, half lion. Juvy: (Smiling) Philippines is also a beautiful country. Elma: (Speaking in Ilocano) Hayna! Agparigatak nga ag English! Nose bleed**! **Nosebleed is an expression in the Philippines. It’s normally blurted out when you’re talking to a foreigner or any English-speaking person and you’re running out or pretending to run out of English vocabulary. Looking at Elma’s expression, we can’t help but let go of hearty laughters that we have been trying so hard to suppress. Elma: There were so many Indians in Singapore. Give them “tawas”*** as a gift when you go home. They will absolutely love it. (Speaking in Ilokano) Hayna! Pirmi met ngatan ti “banglo” da. (Looking at Juvy) Baka met maka awat Ilokano datoy. ***Tawas is a white powder used as deodorant. Cynthia whispered something to Juvy. Shhhhhh… Apparently, Elma’s ex boyfriend was an Indian. Juvy: (Taking the cue from Cynthia) That’s perfect! Can you accompany me tomorrow? I’m going to buy an enormous amount and give to my boyfriend. He’s an Indian. This elicited an ear piercing chuckle from the group. Elma: (Looking alarmed) Oh! Don’t do that. Don’t tell that to your boyfriend. (Speaking in Ilokano) Hala! Kasatnu ngayen data. Baka agapa da. Juvy: But why? You said Indians love “tawas”? Elma: (Looking so helpless and worried) No. Please don’t. Ignore what I’ve said earlier. I have no idea how the conversation was diverted into different mirthful topics and the “tawas” issue soon became a thing of the past. One thing is certain though, the exchange of banter and Elma’s facetious rejoinder tickled our funny bones to the maximum level! She really made our night memorable. Ha! Way to go Elma! You’re such a great sport! Until next time… Remember, don’t be late. See yeah! hahahahahaha u told me this story before!